As a leading moving company in the capital, we tend to every little detail of domestic and commercial removals with care and professionalism. This is well-seen in our top quality packing supplies delivery and services option, which is available throughout London both for clients who make use of our moving services and for separate use. 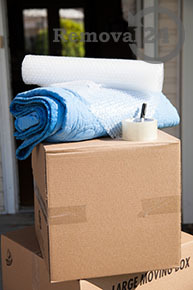 Call us today if you want us to take care of packing your goods for the upcoming home or office relocation. Even if you would prefer to handle the job on your own, you are still going to need proper materials of high quality. So, that would be just another occasion to give us a call. There is no room for compromises when it comes to preparing your goods for the road. You should approach your packing procedures with extra caution if you want your items to be safely transported to their assigned location. So, get the high quality packing supplies you need and deserve from us. They come on very reasonable prices and further discounts are possible too in case you use some of our moving services. If you do not feel up to, or you just do not have the time to handle the packing on your own, then leave it to Removal 24 London’s expert packers and movers to do it for you. The packing in London service we offer you here provides excellent results, the guaranteed safety of your goods on the road and naturally saves you time and energy that you might much better invest in other urgent matters you have on your hands. Just call to tell us when and where you want our packers to be, and we are going to arrange all the details. All of that and more on a competitive price that you are definitely going to find affordable. Contact us today and we will arrange your packing supplies delivery and packing services in London the way you want us to.